A simple and fun way to teach children aged four and over how to spell key first words. 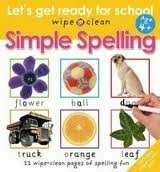 The pages are wipe-clean so that exercises and activities can be repeated to reinforce learning. Comes with a non-toxic, wipe-clean pen which can simply be wiped away with a cloth.